But now, O Lord, for what am I waiting? I love David's question and declaration to the Lord. "But now, O Lord...what am I waiting for?" He had been rehearsing his troubles with the Lord. He wanted to know, right now, what he needed to do. 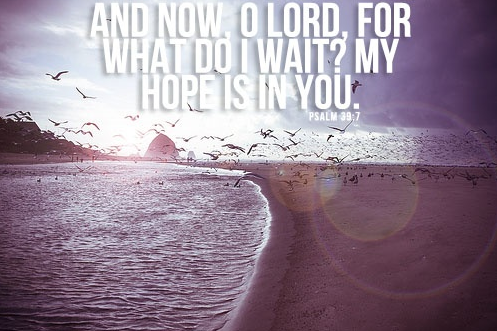 He asks, at this moment, Lord, for what am I waiting? This life as I know it doesn't hold meaning. Life is fleeting; it is often meaningless. In light of all that, what now do I wait for? of looking for with eager expectation and hope. that the eager expectations will be met. can give meaning to his life. He quickly arrives at the answer. You are my only hope! My hope is You! All we really have is now. The present moment is our trainer. It stands before us and asks what we will do. All we have is now faith, now hope, now love. now trust and now courage? We cannot be trained by tomorrow. But now, Lord, what must I do? But now, Lord, for what am I waiting? We ask the Lord to teach us how to live now. We, in turn, present it back to Him. Because He is worthy of all of our nows.